Halong Bay is one of Mother Earth’s most amazing natural wonders and one of Vietnam’s most prized treasures. Abundant scenic beauty, archeological and geological significance, cultural and historical connections, fresh seafood and proximity to international gateways make Halong Bay one of Vietnam’s most popular places to visit. When traveling in Halong Bay, tourists have many opportunities to experience interesting activities such as: kayaking, caving, biking, etc. Specially, having a dinner in a spectacular Halong cave, on a pristine beach near Lan Ha Bay, on a private floating platform or sundeck of a vessel is surely one of the most stunning things in your Halong Bay tour. Dining in a cave is a special activity offered by cruise operators when you visit Halong Bay. 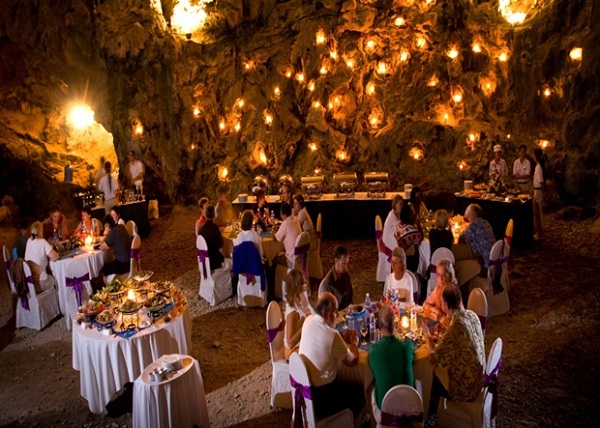 Instead of having dinner on board, you will enjoy the special dinner in a cave. It can be arranged for a big group who held a conference, wedding anniversary or birthday party (20 – 60 people), a small group of friends or family who find for their own space, and it is also ideal for a couple spending their honeymoon. This activity is quite special and worth paying extra. A romantic dinner on Halong Bay beach is always a smart option for you to celebrate a special anniversary such as honeymoon, wedding anniversary and so on. 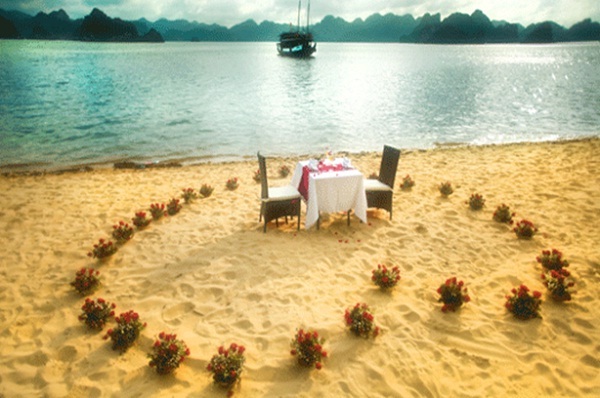 A dinner on Halong Bay’s beach will bring a romance and warmth with delicious food, wine, fresh flowers and candles. On a beautiful quiet beach, you have chance to enjoy Halong Bay’s stunning scenes at night and chat with your family while enjoying your dinner. Other nice option to personalize your cruise is having a dining on the sundeck. Dining on board is normally inside restaurant. 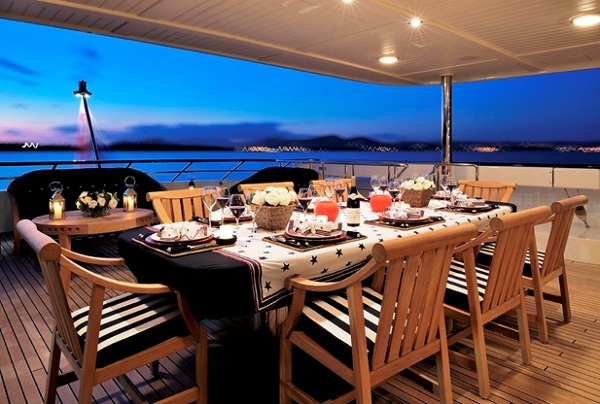 Upon on your request, crew members can set up a dining on the sundeck that can be a party for a company retreat or a special surprise for your honeymoon, wedding anniversary and so on. On the sundeck, while enjoying the delicious food we prepared for you, you will see the panoramic view of Halong Bay with its limestone karts as backdrop. View from the sundeck is breath-taking and constantly changes. Dining on the sundeck offers ideal space and atmosphere to share special moments, to snap great pictures of Halong Bay, to have a refreshing cocktail while gazing at the rock formations reflected in the turquoise waters of the bay and so on. 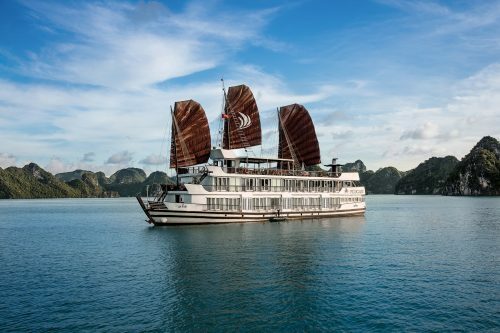 One of the most exciting things you can be offered in your cruise more special is dining on a floating platform on Halong Bay. To have a safe dining on a floating platform, operators only use platforms made of those materials that comply with the regulations of the authorities. 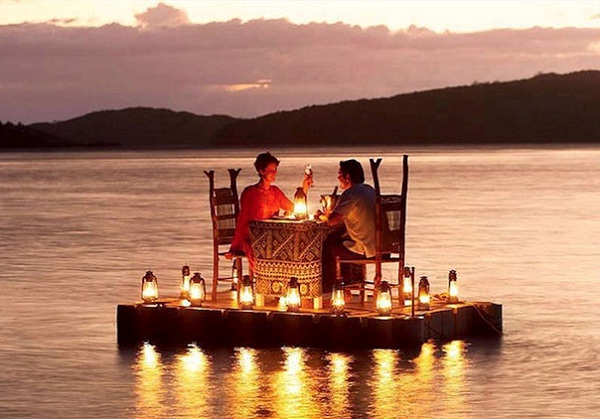 You will experience Halong Bay in true style dining on a floating platform with decoration upon on request. The delicious foods, the quiet ambient, the constant-changing panoramic view and so on make a dining on a floating platform in Halong Bay an amazing experience. These dinners will be one of the best dinners you ever have and the Halong trip will be stay as a wonderful journey in your memory. If you are coming to Halong Bay, it would be such a waste not trying these features out. What to do at night in Halong?